This is not an elegy. It’s a blackberry. another, where I battle for pulse in Others. Ron Riekki’s non-fiction, fiction, and poetry have been published in Shenandoah, Bellevue Literary Review, Prairie Schooner, and many other literary journals. His books include U.P. 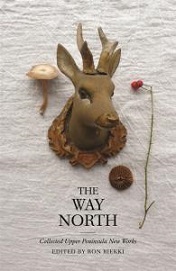 : a novel, The Way North: Collected Upper Peninsula New Works (2014 Michigan Notable Book), and Here: Women Writing on Michigan’s Upper Peninsula (Michigan State University Press). Tough poem, but beautiful in a tough way. But, then again, a tough way to live.